Normally, we never see people getting medals for destroying stuff. They always are seen as the villain and when you're a programmed video game character, you don't get much of a choice except to go to counseling with all your other villain friends. Well, Ralph had been a villain all his life and all he wanted to do was be the hero and go get a medal for doing something good for a change. Not even Fix-It Felix Jr. thought he could accomplish it. But wouldn’t you know it? He actually did what he set out to do! In the end, he made some awesome friends and saved the day finding out that all he had to do was find his place in the world and be himself. 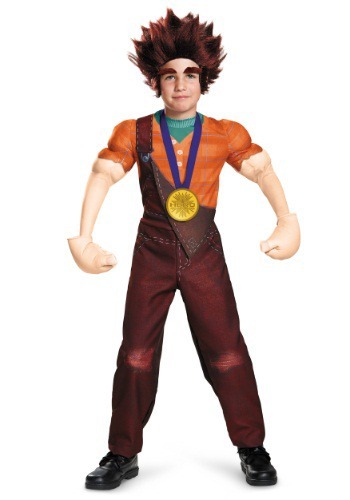 If your kid is fantastic at wrecking stuff (we know we always were), then he should definitely try this officially licensed Child Deluxe Wreck-It Ralph costume on for size. It brings the Disney character's video game looks and lumberjack/construction worker wrecking style to life. That means your kid can smash it up (or wreck it!) while looking great and becoming the hero. The Wreck-It Ralph costume comes with a printed jumpsuit with attached muscle arms for maximum destruction. Stuffed gloves, faux eyebrows, a medal, as well as synthetic wig. Now, when you get him this costume, you might want to lock up the fancy China dish set and hide the keys to the family car. Because with this costume, he's sure to take his wrecking to a whole other level! Arrived in reasonable amount of time. Great quality. All items were in package. Perfect fit. My son is in love with this costume. Perfect fit for 4-6. We had to cut it down a bit because our son is 4, but that makes sense. All the parts were there & easy to manage. The hands were a bit big for my 4 yr old, but would probably be right for a 6 yr old. Loved it!